It's midnight in Mumbai, the city that never sleeps. You'll cycle through the streets of South Mumbai on this fun cycling adventure, visiting all the most iconic landmarks between Colaba Causeway and Bandra Bandstand. 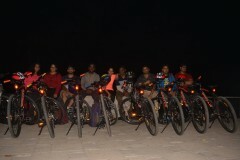 You'll ride for 20 kms, guided by experienced cyclists, stopping to see the lights on the monuments or to admire the night-time views. 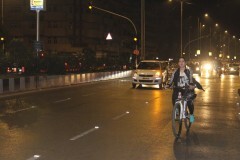 This cycle tour stays on city roads with plenty of illumination, and crosses Mumbai Police check-points enroute. There will be a break at a suitable location, midway for a breather and washroom visits. NOTE: This package includes the rental of helmets and cycles, and is meant for those who do not have their own cycles. 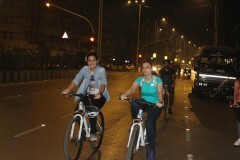 You'll start this cycling adventure in Mumbai from the tourist central of the city: Colaba Causeway. 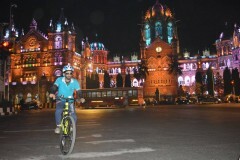 In this part of the town, the heritage buildings are beautifully lit up, making this a bright and colourful ride. You'll go past the Gateway of India and the famous Taj Hotel, proceed onwards past Rajabhai Clock Tower, Bombay High Court, Flora Fountain, CSMT Station, and Oval Maidan. After that, you head out to the seaface where you'll feel the sea breeze in your hair. 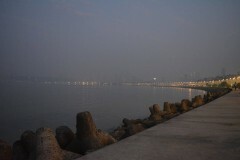 You'll cycle along Marine Drive, all the way to Girgaon Chowpatty, before turning in to get to Mahalakshmi Temple and coming back out on to the seaface at Haji Ali. 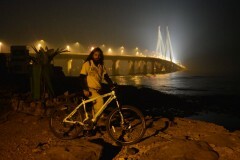 You'll cycle onwards to Bandra Bandstand, where you finally end your Mumbai cycling trip, tired but happy. 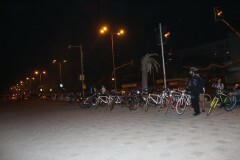 • Ride for 20 kms with like-mided cycling enthusiasts n this Mumbai cycling trip. 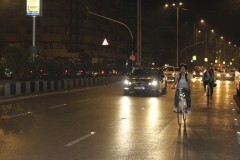 • Discover what Mumbai looks like at midnight, from a cycle. • Cycle past iconic landmarks across the south of the city. 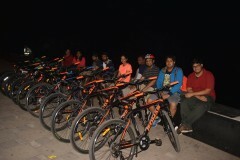 Smoking, alcohol and narcotics are strictly prohibited during this cycling ride in Mumbai. Please avoid carrying large bags packed with non-essential items as the extra weight will tire you out. The decisions of the tour leader during this cycling trip in Mumbai are final and binding. If you cancel this Mumbai cycling trip 15 days before the start date: 75% of the trip cost will be refunded, minus any transaction fees. If you cancel this Mumbai cycling trip 14-10 days before the start date: 50% of the trip cost will be refunded, minus any transaction fees. 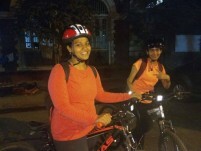 If you cancel this Mumbai cycling trip less than 10 days before the start date: No refund. The operator cannot be held responsible for any physical harm/injury on this Mumbai cycling trip. 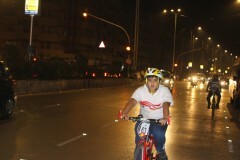 Participants need to be of moderate to high fitness levels, as this is a demanding cycling tour. You will be responsible for your own belongings on the ride. There will be a bathroom break mid-way through the ride to allow everyone time to use the facilities. Please don't stray from the group at any time during the ride. 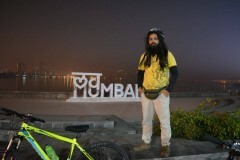 There is no pick-up for this cycling trip in Mumbai. 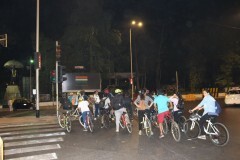 There is no drop-off for this cycling trip in Mumbai. 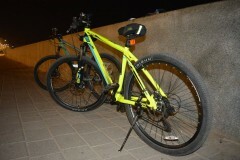 You'll have to report to Madras Cafe on Colaba Causeway by 23:00 hrs, where you'll get your cycle. After a short briefing, you'll set off with the rest of the team. 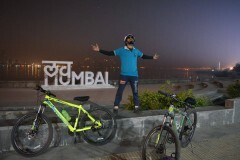 You will pedal past spots like Gateway of India, Taj Hotel, Rajabhai clock Tower, Bombay High Court, Flora Fountain, CSMT Station, BMC HQ, Oval Maidan, Wankhede Stadium, Marine Drive, Girgaon Chowpatty, Mahalakshmi Temple, Haji Ali, Worli Seaface, Sidhhivinayak Temple, Mount Mary and will finally end your trip at Bandra by 05:00 hrs. You'll drop your cycles off here, and the trip ends. • Please carry any specific personal or prescribed medication, and a personal first-aid kit. Madras Café is a famous restaurant at the far end of Colaba Causeway, in Colaba Market. The closest train station is Churchgate. You'll have to take a taxi from Churchgate to the start point.